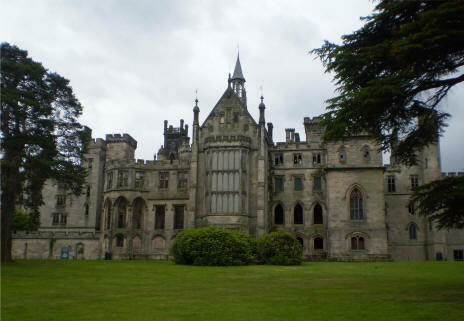 Fancy a nice day-trip to Alton Towers..? Well, it's obviously best known for the huge theme park, located in the grounds which opened back in 1980. The building and the grounds however, have experienced much, much more in their long history. The estate dates back to before 1000 BC when an iron age fort was built in the area, and after this a Saxon fortress and a castle are known to have existed. The earliest version of the building was a three story hunting lodge, known as Alveton Lodge (Alveton being the ancient name for Alton). Through out the 19th century, the building undertook many upgrades and passed through several different owners. In 1924 it was bought by a group of local businessmen, then during World War II was used as an officer training unit and the gardens were closed until 1951. By this time the neglected house had begun to deteriorate and was in such a state, the building had to have its interior stripped out and sold, leaving just an empty shell. In the 70's concrete floors were laid so that it could be opened to the public, and the building was eventually listed as Grade II. The "Hex" ride (built in 2000) which is actually housed in the original armory and picture gallery, is one of the main sources for paranormal activity with stories of countless people being pelted with pebbles and stones whilst queuing for the ride. The ghosts of children in Victorian clothing have also been seen in this area. The presence of an "aggressive male spirit" has been witnessed in the music room, accompanied by ghostly footsteps. Also the most commonly seen ghost is that of a woman in a long black dress wandering the corridors. Psychic David Wells (who visited during Living TV's Most Haunted's visit) believes her to be a past governess who still see's the building as hers.